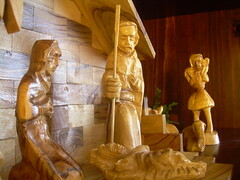 In this nativity scene, a very old Joseph holds a lantern. My grandparents bought this olive wood nativity scene in the Holy Land, back in the day. Joseph has a walking stick. 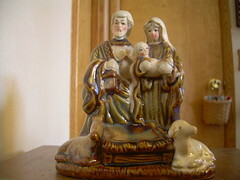 There’s one shepherd, in the background, holding a sheep. No shepherd’s crooks.